The truth is, we just have so very many options and so very many opinions. Thankfully, Jac has been praying steadily for the last 6 weeks for the right name. On Tuesday he attended morning mass and felt drawn to two thoughts about the kind of man the Lord wants this child to be and what kind of saint the world needs him to be. One, that he needs to be a warrior and two, a strong father. We sat with the corresponding names for 3 days. Ignatius after Ignatius of Loyola, the passionate Spanish soldier who later went on to found the Jesuit order. We have long loved his story of single-minded drive to become the best knight and gentleman in the realm and in an act of valor in battle, was struck by a cannon ball. His pride and vanity made him ask the surgeons to rebreak the set bones several times so he would not walk with a limp. As he convalesced, he requested of his sister something to read and she brought him the lives of the saints and reflections on the life of Christ. He fell headlong in love with the Lord and turned his passion for glory into Glory for God and his warrior skills to winning souls for Christ. Giuseppe is for Joseph, Jesus’s own foster father. Both of us have a devotion to the carpenter who was obedient. Wordless in scripture, his actions speak volumes for him. The world needs true masculinity, men to stand in the breach and defend femininity, family, and to be faithful. Who better than the one God chose to be the one to watch over his own son? We went through all the translations of Joseph and Jac just really liked Giuseppe. Cruz, for Juan de la Cruz or in English, John of the Cross. All through this pregnancy, I read about John and his writings. There aren’t many saints that haven’t appealed to me but for some reason, John and Teresa of Avila have terrified me. Mystics, they seemed out of reach and beyond my comprehension. And John’s ‘Dark Night of the Soul,’ seemed so dour and depressing. However, getting to know him and his family, I have found a great friend. His intimate way with the Lord, his humility, his honesty have won me over. I wanted to share this with our son in addition to the fact that his elder brother’s both have Doctors of the Church as parts of their names. John is a doctor so it seemed like a good fit. And finally, Gus. 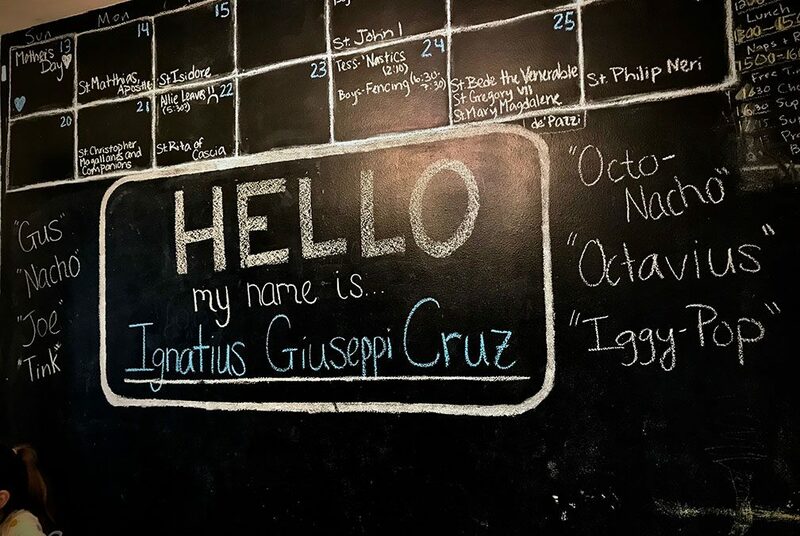 It was suggested as a nickname for Octavius (which is still what the babe is called most of the time) and we saw that it is also used for Ignatius sometimes. With a ‘G’ middle name and each name containing a ‘U,’ it seemed like a good fit. As soon as we can remember to use it, I’m sure it will fit this little blessing perfectly, too. Drew takes teasing-taunting playground nicknames into consideration too. 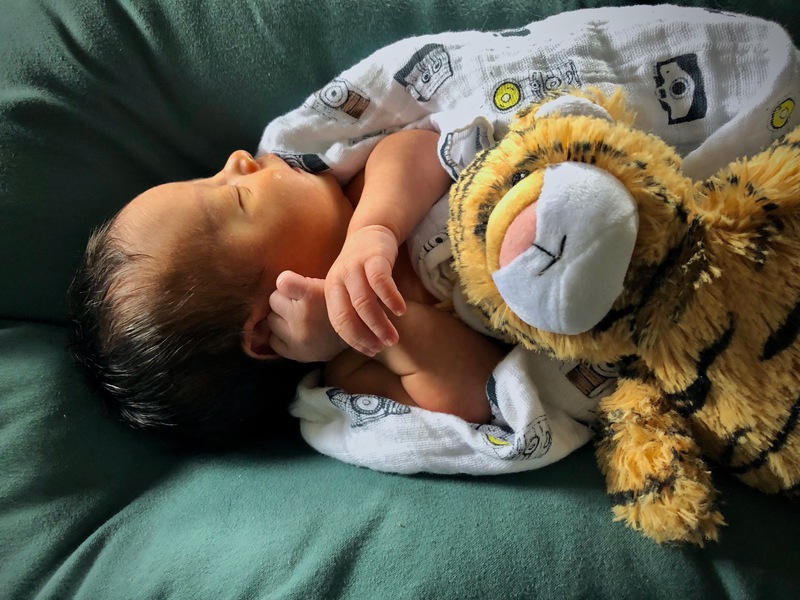 Congratulations and many blessings on the newest member of your clan!